A Columbus Car Audio & Accessories Gift Card makes the perfect gift for any and all occasions! 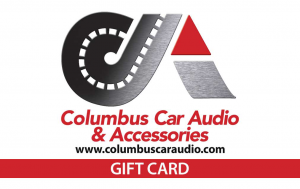 Good towards remote starts, window tint, stereo system upgrades, and much, much more! They’ll love getting the gift of new car technology! 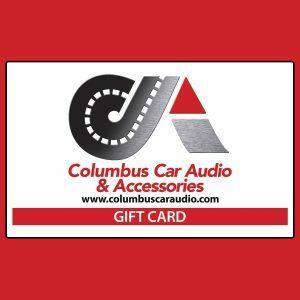 Free shipping for Gift Cards over $100! *Cards are not redeemable for cash. 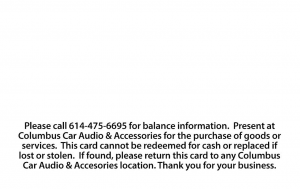 We do not accept returns of gift cards. $50 minimum. If you’d like to purchase multiple gift cards of the same amount, please purchase each as a separate transaction. We apologize for any inconvenience. Call our stores at 614-475-6695 for questions or assistance. Shipping: USPS Priority Mail. Processing takes approximately 5 – 10 business days.